This will be counted as your first attempt. More details to follow soon. The things are not completely clear yet. Still, No need to worry. P.S. I am unaware of codes to be used while filling forms. However, I am posting the queries as it is, anybody having any idea, can reply to those queries. However, I would request you to get in touch with CBSE. Even some coaching centres have dedicated staff for that matter. If anybody can write a post on how to fill the exam form, that would be really helpful. I would post on his/her behalf. If you people have any other thing to share, you can write about that as well. 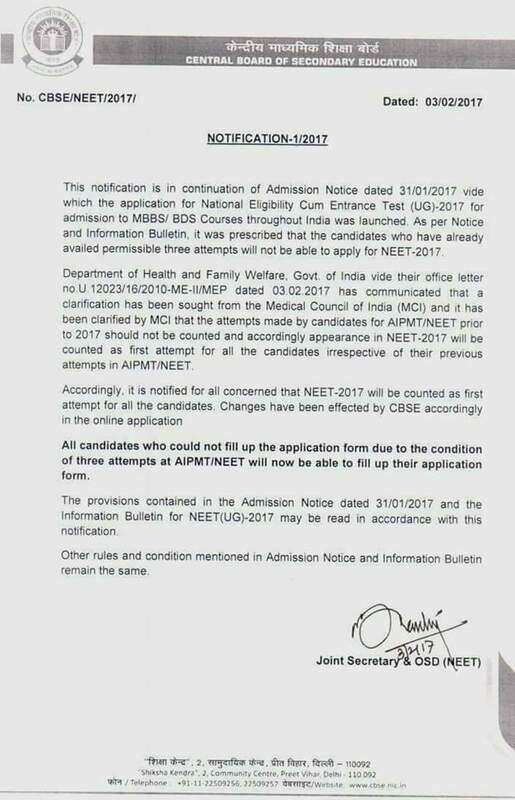 This entry was posted in ADMISSION COUNSELING and tagged 2017, AIIMS, AIPMT, CBSE, neet, NEET 2017, NEET ATTEMPT, NEET ATTEMPT CANCELLED, NEET ATTEMPTS, NEET GURUMANTRA, neet preparation, NEET UG, PMT. Bookmark the permalink.